Catch the last episode of the present series of The Big Debate: Dinokeng Scenarios tonight at 8pm on the eNews Channel (DSTV Channel 403). It's a particularly fiery debate on sustainable energy and climate change. Find out why Environment Minister Buyelwa Sonjica believes that South Africa should go on polluting for another 25 years before we begin to cut our carbon emissions. Also check out a simple solution to the Eskom crisis within reach of suburban homes. Finally see whether there's any substance to Shell and Nedbank's claims that they are going green. This programme will be rebroadcast this weekend on the eNews Channel at these times: Saturday 06h00 and Sunday 08h00. WATCH ONLINE: Episode TWO: Is Transformation off track? WATCH ONLINE: Episode THREE: Is our Foreign Policy immoral? WATCH ONLINE: Episode FOUR: Do we need a new Economic Policy? WATCH ONLINE: Episode FIVE: Is Education safe in government's hands? Download 5 weekly Independent Newspaper supplements to accompany each theme of the shows. "3 Futures" were printed in The Star, Cape Argus, Pretoria News and Daily News during November 2009. 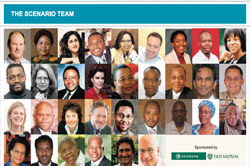 These supplements are available on the materials page or can be viewed directly on www.iol.co.za/dinokengscenarios website of the Independent Newspapers.